Not even halfway through Midwinterblood, I realized a few things very quickly. First, it was absolutely unlike any other YA book that I've read recently. Second, it was the kind of book that I wanted to start reading again right away after finishing it -- once I started putting puzzle pieces into place while reading, I had the desire to go back and start over to really see how all of the plots connected. I thought this book was phenomenal. This is a hard book to talk about without spoiling things -- once you start making connections between the various stories, all of the pieces fall into place on their own, and I don't want to take that moment away from anyone -- but here goes. Midwinterblood starts out in the far future with Eric Seven, a journalist traveling to remote Blessed Island to investigate claims that the islanders are immortal, thanks to a mysterious drug or medicine. While there, he gets to know the islanders fairly well, including a woman named Merle, who he finds himself instantly falling for. It's insta-love, yes, but there's more to it than that, trust me -- keep reading the book to find out. Believe me, I'm the last person to recommend insta-anything, but this is worth your time. Eric tries to uncover the island's mysteries, but there are more secrets than he bargained for. From Eric's story, the novel goes backwards in time, following in each segment another group of people whose lives have been intertwined with Blessed Island throughout history. There's an archaeologist, hoping to uncover historic artifacts; an old man past his prime who might still have one last painting in him; a sad nanny telling a tragic love story to her young charges; a King atoning for the troubles of his kingdom. All of these stories are intertwined, and as each section progresses, you begin to see how the stories overlap, how there are certain words and phrases and motifs which appear in each story across time. It's an English teacher's dream come true -- not that I'm a teacher, but if I were, I would totally assign this book to students to read and analyze for a paper. Some of the sections of the book are bittersweet, some are fraught with danger, some are super creepy. It's very hard to categorize this book, to assign it a genre or say it's similar to something else. It's very often a horror story, but not in a nightmarish/gruesome sort of way. There's just a creeping suspicion as you're reading that all is not quite right, and the final reveal at the end answers all of your questions and takes your breath away. 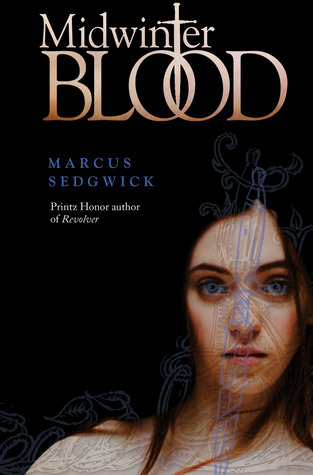 It's definitely a book which I plan on buying a finished copy of, and I want to go back and read Marcus Sedgwick's other books, because if they're anything like this one, I'll love them, too. This isn't a book for everyone -- Sedgwick's writing is very atmospheric, stark and economical. The book is short, and all of the words he uses pack a punch. He knows how to set a mood. Like I said earlier, this book is totally unlike any other YA I've read recently. I don't know that many average teenage readers who would have the patience for this -- I'd recommend it to that teenager who salivates over the Complete Works of Edgar Allan Poe (aka teenaged-me), but not to someone who isn't into delayed gratification, obscure Swedish history (yes, there are tiny grains of truth scattered throughout this book), or a lot of heavy symbolism. I was a bit nervous at first as I noticed the book has fairly average reviews on Goodreads, but I should know better than to judge by that -- there are plenty of highly rated books there which I thought were terrible. I think neither the book summary nor the reviews really do the story justice. If this book sounds like something that might interest you, I highly suggest you give it a try. Wendy D. compared this with MONSTROUS BEAUTY, but I don't think that can possibly be fair. This one sounds like a work of art!